The 2016-2017 academic year of the PhD in Health and Rehabilitation Sciences program (Left to Right): Dian Ramawati who is mentored by Dr. Pamela Block in Disability Studies; in the Rehabilitation and Movement Sciences, Krista Fjeld is mentored by Dr. Erin Vasudevan; Pawan Sharma is mentored by Dr. Prithvi Shah; XiaoQing Zhang is interested in Behavioral and Community Health and mentored by Dr. Sharon Ray; Alexandra Wagner is mentored by Dr. Pamela Block in Disability Studies. The PhD Program in Health and Rehabilitation Sciences at Stony Brook has started its 2015-2016 academic year with four new PhD students: In the Behavioral and Community Health Concentration Chris-Mike Agbelie (top left) led by Dr. Michele Friedner and, in the Rehabilitation and Movement Science Concentration, Jack Comeau (top right), mentored by Dr. Robert Streb, Allison Ambort (left), mentored by Drs. Sharon Ray and Erin Vasudevan, and Luigi Pesce Ibarra (right), mentored by Drs. Erin Vasudevan and Ray McKenna. We welcome them and wish them success in their doctoral pursuits. 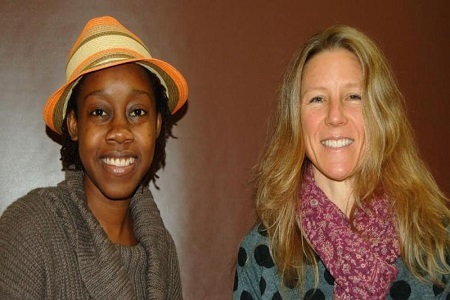 Please welcome the two students of the incoming class for the 2014-2015 academic year of the PhD in Health and Rehabilitation Sciences program:Sylette Henry-Buckmire and Cassandra Evans, Ph.D. Students in the Disability Studies Concentration. Please welcome the four students of the incoming class for the 2013-2014 academic year of the PhD in Health and Rehabilitation Sciences program: Andrew Campos (left) in the Behavioral and Community Health Concentration led by Dr. Carlos Vidal, Maria Milazzo (bottom) in the Disability Studies Concentration, mentored by Dr. Pam Block, Mayank Seth (top) in the Rehabilitation and Movement Sciences Concentration, mentored by Dr. Eric Lamberg, and Mitra Varedi (right) in the Rehabilitation and Movement Sciences Concentration, mentored by Dr. Ray McKenna. Help wish them success in their doctoral pursuits. Please welcome the first students of the PhD in Health and Rehabilitation Sciences program for the academic year of 2012-2013: Lorraine Danowski (left) in the Behavioral and Community Health Concentration, mentored by Dr. Debra Dwyer, Sue Rabinowitz (second left) in the Behavioral and Community Health Concentration, mentored by Dr. Sharon Ray, Faiza Qureshi (center) in the Rehabilitation and Movement Sciences Concentration, mentored by Dr. Sue Ann Sisto, Gretchen Specht (second right) in the Disability Studies Concentration, mentored by Dr. Pamela Block, and Cynthia Spragg (right) in the Behavioral and Community Health Concentration, mentored by Dr. Brooke Ellison. Help wish them success in their doctoral pursuits.